Strudy structural channel type Mast of electrically welded construction, main members made out of heavy duty structural steel channels reinforced with suitable cross members, so that it will be strong enough to withstand the varying drilling loads. Heavy-duty Hydraulic driven Top head Rotation unit having infinitely variable speed (0 to 500rpm) will be provided. This unit travels on the Mast and is of sturdy construction to absorb sudden & varying shock loads generally encountered during drilling operations. The feed system has the following capabilies. The feed system will be incorporated with Hold back arrangement to control and limit weight on bit, rapid and slow feed arrangement to suit the variable ground conditions. Power required for the rig Hydraulics shall be drawn from the tractor engine through the out put shaft (PTO). 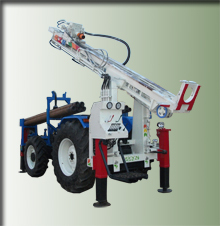 System consists of three Hydraulic Leveling Jacks with 'Reverse flow restricted valves to ensure safe operation. Two numbers are at the front (Operator side) of the rig controlled by two separate valves and one jack at the rear side of the rig controlled by a single valve. The Drill Rig is equipped with Hydraulic breakout wrench for tightening and loosing of Drill pipes and The Hammer. Triplex plunger pump shall be used for DTH Drilling. Hydraulically operated wire line winch is mounted on mast to handle the Casing Pipes, Drill pipes and other handling tools. Air compressor of suitable capacity mentioned can be used for carrasying out the DTH drilling activity. Note: The compressor shall be mounted on separate two wheel single dummy axle waith mechanical stabilizers quantity one number. Air line lubricator of capacity mentioned below shall be mounted for the supply of lubricating Oil to the hammer. Copyright© 2011 BHS. All Rights Reserved.